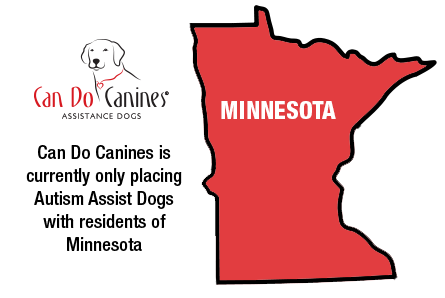 Can Do Canines is currently accepting pre-applications for Autism Assist Dogs. Pre-applications reserve a place on our waiting list, which is currently two to three years long. Once our current applicants have been served, we will contact families on the waiting list to begin the full application process. The family must reside in Minnesota. The child must be between the ages of 2 and 7 years old. This is the age range in which a dog can realistically be expected to be able to help restrain the child physically, and takes into account the current two-year waiting list. The child must have an autism diagnosis. The family must be physically and financially able to take full responsibility for the dog after certification. Due to the high demand for Autism Assist Dogs, we are unable to make exceptions to these criteria at this time. We are currently unable to consider pets for owner-training for the Autism Assist Dog program. After Can Do Canines contacts you to complete in application, click here to learn more about the next steps involved in finding an assistance dog just for you. We are currently NOT accepting applications to train pet dogs to be certified as Autism Assist Dogs.